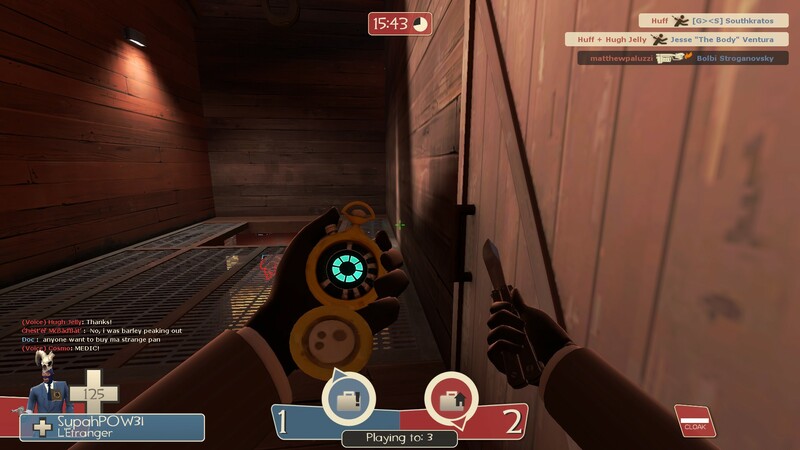 Nowadays, a lot of players say the disguise kit is useless, that it exists only for slipping past sentries. Poppycock, I say! These players could use a little class, I think. To use disguises effectively, one shouldn’t pop one on and hope that their foes won’t randomly shoot them, but they must act. Yes, friends, welcome to Acting 101 for spies. 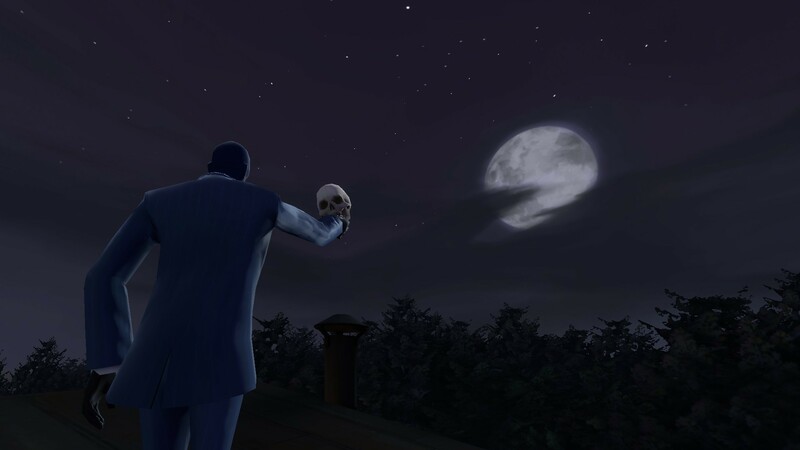 Alas, poor Heavy. I knew him well. Picture by Huff. Yes, when it comes to judging players by their items, assuming that the Burning Flames TC Soldier is better than the Gibus Spy may be kind of a ♥♥♥♥ move. When playing as a Spy, you have to assume that everyone is going to be a ♥♥♥♥ like that. To fool your opponents with disguises, you must play off of stereotypes, expectations, and the actions and items of the player you are disguising as. Take a moment to flip through the weapons of the new you. Do you see common weapons? Highly leveled stranges? Rare items like the Big Kill or a Strange Kritzkreig? Look for them in combat. Are they wearing a Gibus/Pyrovision Goggles/Mercenary getup, or do they sport A Max’s head and a pair of Earbuds? Now, it’s time to be a ♥♥♥♥♥♥, assume people are only as good as their loadouts, and hope the other team does the same. I don’t know about you, but I think this guy knows that sentries hurt when you run into them. Picture by Huff. The purpose of this is to determine, to the best of your abilities, if this player is experienced or not. As a rule of thumb, a sparse player can of course be good, but they’re more likely to not know how to jump and shoot at the same time than the guy with 5,000 kills of his Strange Festive Scattergun. It could always go the other way, but still, more things usually mean more dedication. Of course, make your own judgment. Call me a tool for assuming so, but this guy might not know the fine mechanics of the game as well as the guy with the tasteful Fedora and turtleneck combo. Picture by Huff. Of course, items aren’t the only way to judge skill. Make sure to keep an eye out during combat, and take note of how players act. Is that Pyro W+M1ing? Does that Sniper rush with his SMG? Does that Scout like to jump around and annoy his enemies? When you see them, make sure that you can act like them if needs be. A. Masquerading according to “skill”. If I could please direct your attention to anangrysockpuppet’s “Team Service Announcements” series, specifically “Scout Combat” for a moment, it will help explain this section. 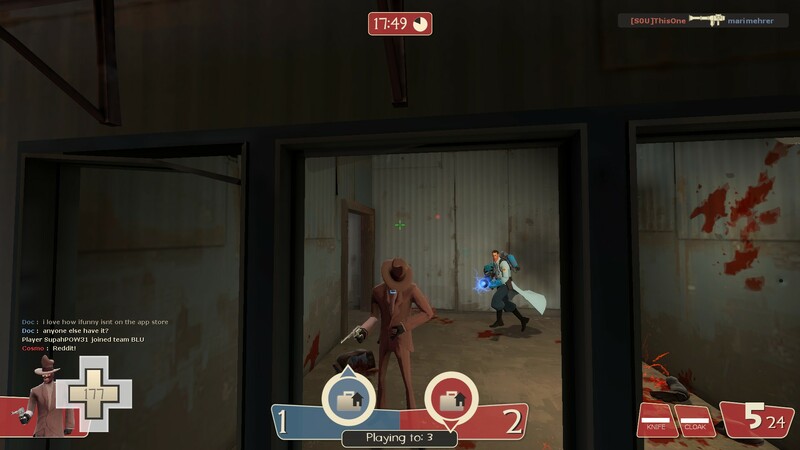 Notice how the Scout and the RED team act. In this scenario, the Scout is a novice player, either unskilled and learning how to get into the game. He acts very simply, running into combat and never saying anything meaningful. When disguised as a new or inexperienced player, act like the Scout. be simple in your movements, only use the MEDIC! voice command, and act awkwardly. His teammates, if they have noticed this Scout acting like this, will pass over you, perhaps cursing in their heads. This can backfire, though, and people might think that you, as a Spy, are inexperienced, and shoot you anyways. Such is life. If you find yourself dressed as an experienced player, act like you know what you’re doing, but are able to goof off a little, like the RED team in the video. Use voice commands to laugh, compliment your enemies on good shots, or ask for help. They’ll recognize that you’re acting your part, and you might even experience a little camaraderie before you stab them to death! B. Fitting in with your surroundings. Sniping’s a good job, mate. Wouldn’t you agree, Medic who is totally my teammate? Picture by Huff. Make sure you know which class goes where on a map. If I see a friendly Engineer on the frontlines, I’m going to be suspicious. Be the class that matches your environment. On the 2Fort battlements? Disguise as a rifle-toting Sniper. In the water in Well? See if you can roll a Pyro with the Annihilator. Stuck by an abandoned Engie’s nest, but there are too many enemies about to not have someone notice you sapping it? Be the Engineer himself, and babysit the buildings until the coast is clear for a clean sapping. As in acting, you must hit your mark, and don’t jump your cue. C. Gaining trust and abusing it. Now you find yourself in a pack or with a single buddy. You desperately want to stab them, but there’s no way in hell you’ll be able to make two swings before you’re put out of commission. Act like you’re helping them! Rounding a corner into your own base, quickly retreat, explaining, through voice commands, that there’s a sentry gun or pack of players ahead. Crouch, yell at the Heavy-Medic pair leading your group to go ahead, and wait until they go. Once they’ve all taken your advice and have gone ahead of you, show them that the true danger was with them all along while they’re distracted. D. Using your teammates’ identities. This tactic is much more useful for the Dead Ringer spies out there. Of course, it’s pretty simple. When rushing into a crowd at the beginning of the match to quickly get behind their lines, don’t just slap on any friendly disguise, or worse, an enemy one that immediately blows your cover, but play on expectations again. 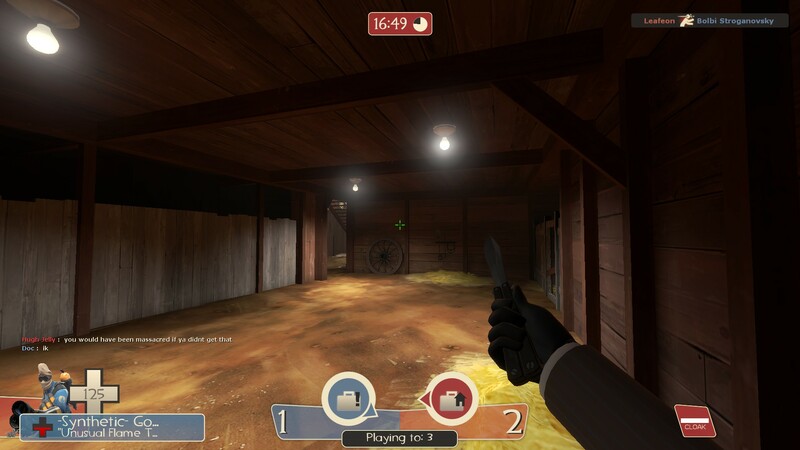 Try out a stock Pyro from your team, and act like you’re W+M1ing into the fight before you activate your DR. Be an overzealous Scout who thinks he can take down the entire enemy team with his Wrap Assassin. If you run in as a friendly Heavy who goes down with one SMG shot or an enemy Scout, they’ll know it was a Spy, and it could spell the end for you. To be a Spy, you must be deceitful- you have to gain trust, steal identities, and fit into the crowd. It’s tough, but a little acting can help get the job done with a bit more smoothness and a lot more grace. Unless, you know, someone on the other team has a flamethrower. This isn’t actually related to the subject of this blog post, but I might as well post it here for the few people who’ll actually read it as it’s the latest post. Yeah, I got banned. No, I have no idea why, as I can’t actually check my latest infraction due to being banned. Quite a catch-22. I plan on asking Steam Support about it, but I won’t hold my breath about getting this appealed. I will say that I did have eight infraction points at the time, reason being my recent posting of the Rebuild of Itsurblog thread. Thread got locked, I got infracted, then presumably something else happened to get me another infraction this morning. So be it. If I got banned ultimately because I was reposting a fun thread everyone liked, I can’t think of a better way to go. Albeit I won’t be gone for good. Chances are I’ll make some sort of alt within the next few days if Steam Support ends up being a dead end. Albeit I am somewhat surprised and touched that people actually noticed my ban and made a thread about it. Yes, even if it only got a number of replies that can be counted on one hand. But yeah, I plan on returning at some point either way, whether it be with a new account or an appeal. If appeals on SPUF are actually a thing, anyways, I have no idea. How else would I be able to get the key for bumping aabicus’ Jump Day thread?